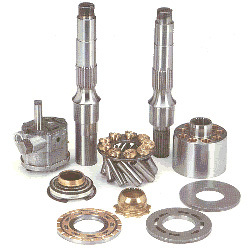 Hydrostatic Transmission Service, LLC offers Sundstrand hydrostatic parts for Sundstrand hydraulic pump repair and or any of your hydrostatic parts needs regarding Sundstrand equipment.When you need Sundstrand parts for any Sundstrand Pump call us first. Hydrostatic Transmission Service, LLC offers Sundstrand Hydrostatic/ Hydraulic pumps or Sundstrand Hydrostatic/ hydraulic Transmissions for the concrete Industry. We offer a wide selection of Sundstrand pumps used on concrete mixers or concrete trucks and the asphalt industry. We have most Sundstrand hydrostatic/ hydraulic pumps in stock and can build what you need usually in one day. Whether you need Sundstrand hydraulic parts for cranes, asphalt equipment , concrete trucks, sweepers, rollers, brooms, excavation equipment, skid steer loaders, combines, cotton pickers , or whatever, we can help you.